It is hard to see what M&S were aiming for with the torn piece of paper graphic. Maybe this was just the notes for a proper design. We do not like to be unnecessarily critical, but the Simply branding is Simply uninspiring, old fashioned and frankly, poor. 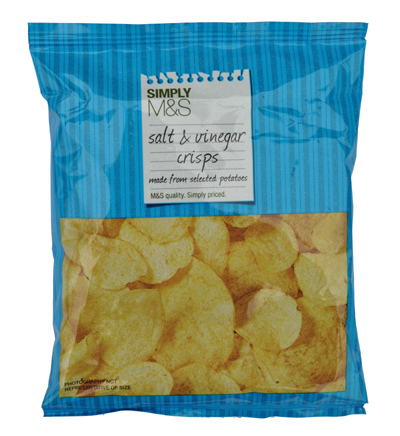 Although these were standard thin cut Crisps, they did not smash to pieces with a first munch as is often the case. There was a firm, crispy crunch that was hard enough to say they featured a nicely balanced crunch to munch. These Crisps had a standard thickness to them. Half of the bag featured broken constituents. Most of the whole Crisps were fairly flat with virtually no visible oil bubbles. There was a fair few with skin on their edges. A Fore-Thumb Test revealed a greasy sprinkling of salty seasoning. A Nose Plunge Test featured a mild stinging sniff of vinegar. The taste was a very well balanced combo of potato, salt and vinegar. However, the taste was so mild it did not really feature on a comparison chart. Having said that, there was a nice after-taste.